Distribution: Considered native to Europe and Asia, the brown trout is distributed widely throughout the world. It is stocked in a number of waterbodies throughout New Hampshire. Description: With a body shape typical of other trout, the brown trout has a dark, olive-brown coloration with black and sometimes red spots on the body, fins, and tail. Immature brown trout have eight to ten parr marks on their sides and closely resemble Atlantic salmon. In New Hampshire, they can be caught at any size –from 4 inch yearlings to those that exceed 10 pounds. Habitat: Typical of all salmonids, the brown trout thrives in cool, clean water. It favors the slower, deeper areas of lakes and ponds as well those areas in rivers and streams. The majority of their diet includes invertebrates and other fish. Prey abundance is a strong factor in habitat selection. Life History: Brown trout spawn in the fall when they seek the gravel bottom substrates that females prefer for building nests (redds). After external fertilization occurs, the eggs are covered and left to develop. The low pH and calcium levels of most New Hampshire waters are not suitable for natural brown trout reproduction. However, there are a few examples of naturalized populations of brown trout where water chemistry is suitable for reproduction, including parts of the Androscoggin and Cocheco River watersheds. 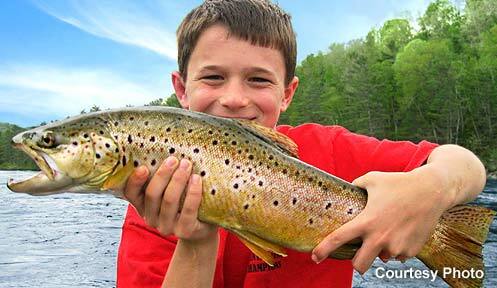 Conservation/Management: Brown trout are managed to provide opportunities for NH anglers. Hatchery fish are stocked annually in those waterbodies that support healthy fisheries. Recommendations:Continue to manage as a popular gamefish and monitor populations within varied waterbodies.